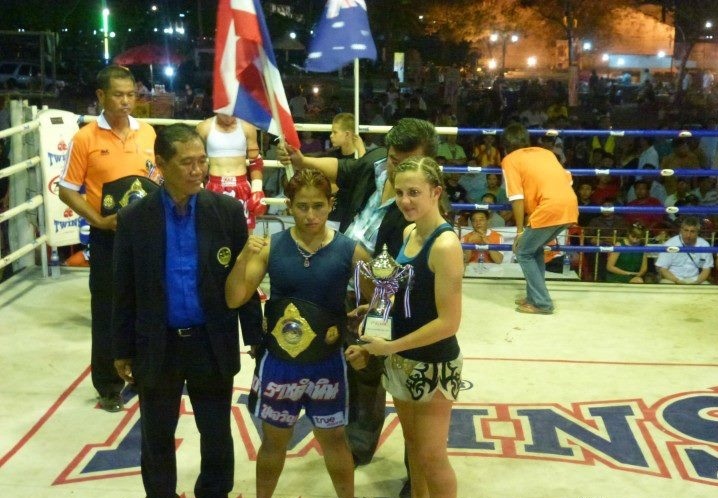 This fight was two days after my previous one against Sarah Brown from Australia, for the final of the AITMA Naikanomtom Championship Tournament in Ayutthaya. After winning that initial bout, I was told that I would face a Thai in the final. 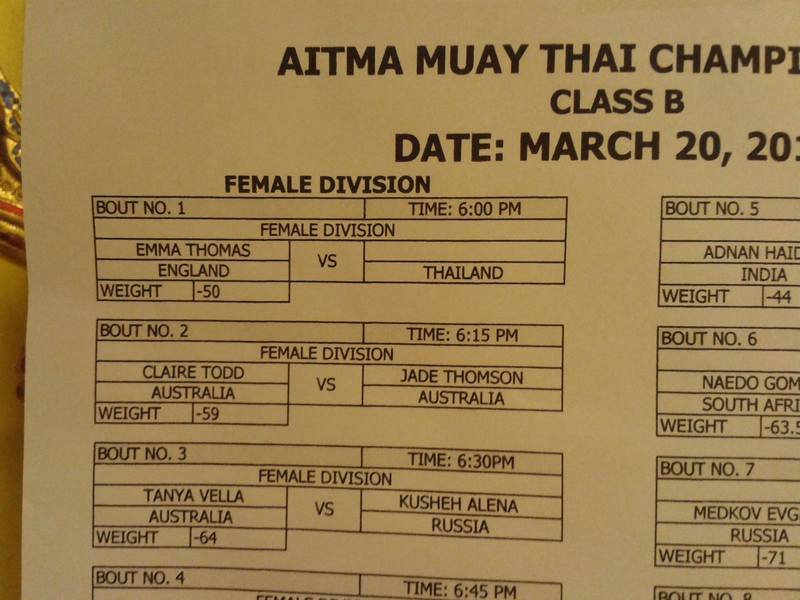 There were no Thai girls present at the weigh-in on the first day of the tournament. In fact, Sarah was the only girl there who was in my weight class, so to my knowledge, I didn’t have an opponent. I wasn’t confident that I would even have another fight, but was assured they were bringing in a Thai girl for me. So, I waited. If I’m honest, I half wished that there was no fight for me. 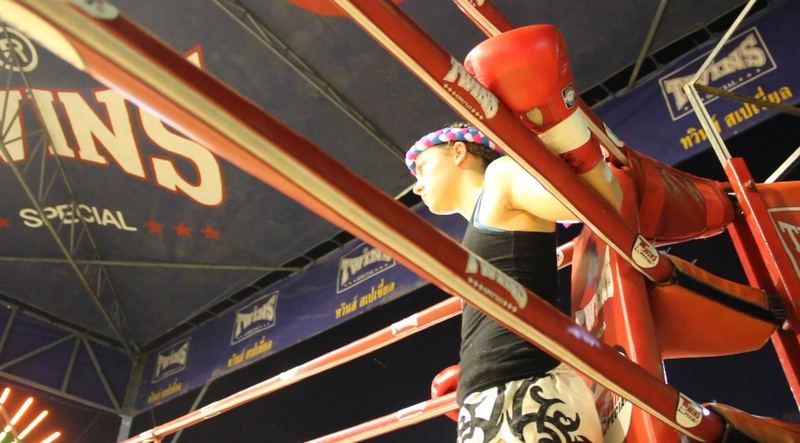 This was to be my fourth fight in just one month, and I was both mentally and physically exhausted from it all. My shins were so badly injured that I could barely kick, and I hadn’t been able to train much during that month. On top of that, I’d also been working my usual six days a week, so there was very little time for me to rest and recover. All in all, neither my mind nor my body were prepared for this fight. If I wasn’t stressed enough, I was asked to drop a further 3kgs just five days before the fight. Cutting weight was something I’d never really done before, and this added further stress to the process. I am usually determined to make the best of every situation, but I was finding it hard to be positive in this one. However, I persevered, and began cutting weight via the water method (which Sylvie Von Duuglas-Ittu describes in great detail) and on the advice of my trainers, cut anything other than fruits and vegetables out of my diet. Cutting weight without having an opponent seemed like a pointless virtue, but I did as I was told. Even on the day of the fight, we still had no idea who my opponent was. The fight schedule showed a blank name next to mine, where hers should have been. I prepared to fight, but wasn’t sure that I would. As I was the opening bout, I arrived at the venue early to prepare, but even then, there was no sign of anyone. It wasn’t until after I got my hands wrapped that I was told she had arrived. Still, I couldn’t see her. The fight schedule, with no known opponent listed for me. Just minutes before the fight, I finally caught sight of her as she walked around the corner of the ring. It was then that I realised why she’d been kept out of my sight for so long. At first glance, she must have been at least 60kgs, 10kgs more than me. She was actually a little shorter than me, but clearly carrying a lot more weight. There was no way she should have been my opponent, but as there were no other Thai girls competing on that night, I knew it could only have been her. I quickly turned to my trainer and made it clear that I wasn’t happy, but he hadn’t yet seen her. He ran off to check her out, and then came back with his head down, telling me not to worry. I barely had time to think about it before getting into the ring, but I felt frustrated as I did so. It seemed as if everything was against me, but I had to fight. After all, it was only three rounds. This tournament didn’t have any A-class bouts for females, so I was fighting at B-class, which meant wearing shin pads and elbow pads. As my trainer was rushing to put my gloves on, he seemed to forget the elbow pads. I reminded him, and he stopped to take one of my gloves off, before glancing over to my opponent to see that she was ready to go in without any protective gear. So, it seemed that was the way we were going to do it. I have no problem with fighting without protective gear, as that is how I’ve always fought, but at that time, it just added to my frustration. All of the other fights adhered to the rules, but there seemed to be one rule for everyone else and another for me. At this point, one of the other girls who was also competing told me that she’d heard that my opponent was 64kgs, while I weighed in at just 50kg. As I made my way to the ring, I felt resentful of the entire situation. I’d been asked to cut weight only to go up against someone much heavier than me, who came straight to the final without competing in the first round of the tournament, in what was supposed to be B class bout, without the protective gear that everyone else had to wear. My mind was not in the right place to fight, but I had to get past all of the negative thoughts and just do it. During the fight, I tried to keep my distance, knowing that with the weight difference, just one wild swing could have ended the fight. My sore shins meant that I favoured punches over kicks, but each time I boxed her, she would clinch me and throw me. When I did throw kicks, she would catch it and throw me again. It was really disheartening to be in the ring with someone who I didn’t have much chance of fighting at that time. She was clearly very experienced, and that, coupled with the weight difference, didn’t bode well for me. It was clear that it was a total mismatch, and despite my best efforts, I couldn’t overcome the odds. The final round was the worst. Each time I blocked her kicks, the pain in my shin sent a sensation all through my body. At one point, I must have not been able to hide it anymore, because after cracking my shin again, she nodded at me as if to acknowledge my pain and agree not to do it again. It was embarrassing. I shouldn’t have been fighting this woman even if I was at 100%, but in the state I was in, I couldn’t put up much of a fight at all. As the final bell rang, I could barely hold back the tears. I wasn’t upset for losing the fight, as I have absolutely no problem with losing if I’ve done my best and have been able to learn. I simply felt let down, as if no one was taking care of me. As I stepped down from the ring, no one said a word to me. I walked with my trainers around the corner, out of sight of the crowd, and the frustration that had been building up inside of me for the whole day came out of me in one burst, as did the tears. Shortly after, I was called back to the ring. My opponent and I walked up, and she was presented with a belt. As well as coming straight into the final of a tournament without weighing in, and fighting someone over ten kilograms lighter than her, she was also given a belt! We posed for pictures, but everyone involved knew that it was a joke to name her the winner of the sub 51kgs division. It was quiet and awkward, and I wanted to get out of the ring as soon as possible. As we did so, she stopped to apologise to me, telling me that I shouldn’t feel bad because at 34, she was much older than me. I asked her how much she weighed, knowing that she wouldn’t give me the real answer. She responded with ‘48 kg’. Later, it transpired that she had previously fought a friend of mine, indeed weighing in at 64 kg. I was later told that my opponent’s manager had promised to bring a different girl, but switched them at the very last minute. Whether or not that was true didn’t matter at that stage. I also found out that she usually fights at 63-64kgs, and had once fought and beaten a friend of mine. This was the only way that I was able to find out her name, Jack Por. La Sear. As it seemed, they’d brought in a fighter who was way beyond the agreed weight class, and apparently not even aware that it was a B-class fight. I wondered why they were allowed to do that, and why someone didn’t mention how absurdly and obviously unfair it was. I’d worked so hard to train through injury and cut weight to be able to make it to this fight, but what was the point? How was it fair that they were able to just walk in and take that away from me? The whole situation made me feel like I’d been cheated. On reflection, I can only conclude that it was a result of both my trainers and the promoters not wanting to lose face, and unfortunately, it was at my expense. If we had refused to fight, it would have looked bad, and I imagine that she would have been automatically announced as the winner. So, it was better for them to just let us fight. Needless to say, I spent the day after the fight in a less than great mood. Luckily, lots of my friends had sent me various packages of chocolate through the post, as I had made no secret of the fact that chocolate was the thing I was most looking forward to after a month of fighting. So, I spent most of the day feasting on that. Afterward, I felt much more positive. Although the thought of the situation made me feel quite resentful and emotional, there was no point in dwelling on it. I am not usually one to react so negatively to fights, and I didn’t like how this one made me do that. I also don’t want to complain too much about this fight, as I know that a lot of people might have gone into this situation and still come out with a win. Wins and losses aren’t so important to me, but experiences are. This wasn’t one of the best experiences, but an experience none the less, and I accept it, whether it was fair or not. I just had to just brush myself off and carry on. Sometimes, this sport can be unfair, but you just have to take the good with the bad and do the best you can. i have had the similar things happen to me in Thailand where they told me they didnt know who i was fighting and i ended up fighting the wmc world champ. Its so dodgey like that it sux but i would still rather fight there than any where else in the world 🙂 just gotta brash it off.